Dave Turner, How to be Dead. Aim For The Head Books, 2013. Pp. 75. ASIN B00H17V7OS. £0.99/ $1.63. Dave is not an obvious hero. He’s a bit of an apathetic worker; just marking time perma-temping at a big business. He knows how to handle the pushy behaviour of his manager, but goes to pieces over Melanie—the girl of his dreams and office hottie. Oh, and he can see ghosts. While saving Melanie’s life on a Halloween night out, he is hit by a car and has a near-Death experience. Literally. He and Death go to a pub and Death offers him a new career opportunity. Revived, and with a greater zest for life (primarily due to the life-flashing-before-his-eyes thing being just a sequence of mundane nothingness he wants to seriously improve), Dave decides to see what Death was on about. However, his heroics have made a hit at work, and progression into the ranks of upper management, with his own office and no clue as to what he should be doing beckons Dave with golden temptation. Will he make a deal with Death and agree to help lay tormented undead to rest? Will he strike lucky with Melanie? Will he ever get to grips with his computer? The story is not an entirely brand-new premise: bit of a loser, diamond-in-the-rough type living a humdrum life has a supernatural encounter and as a result starts to develop semi-heroic habits. Much the same as the most obvious progenitor Shaun of the Dead, Dave is stuck in a rut, with a slobby flatmate, a smart girl to impress and a Bigger Picture to face up to. Dave might not be belting zombies with a cricket bat, but this is just the set-up, the ‘Early Years’, as it were. More is expected to come in the same vein from Turner, as we are promised that Death and his companions will be fighting “ghosts, zombies, vampires and medium-sized apocalypses” (howtobedead.com). 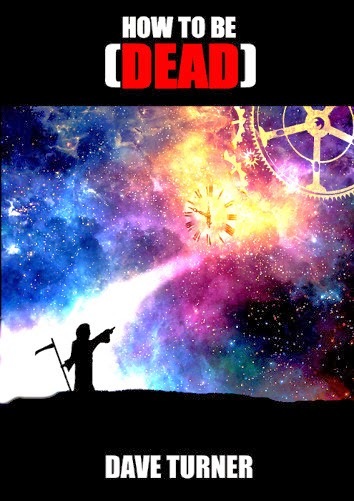 How to be Dead epitomises the best of the escapism of comedy-fantasy (indeed of any speculative sub-genre), but lands it right into a personal spot in the reader, because its hero is one we can all relate to. This is primarily due to the rise of the ‘super’ nerd: the ‘special’ but commonplace character. Nearly all mainstream speculative fictional personalities of the last twenty-odd years have in common a sense of being ‘chosen’. The modern celebrity culture (through scandal, reality TV show, etc.) appears able to pluck anyone from obscurity and throw them into the limelight. It carries echoes of Ancient Greek myth, where a hero, unknowing of their destiny, is chosen by higher powers for a purpose. Counter-culture made a point of placing the least likely candidates into this heroic mould, and these in turn have become mainstream by prevalence of example. But unlike the glitter of selfish celebrity fame, these normal-heroic types are protectors of humanity, keepers of the door. The nature of their heroism is something more achievable; for heroic dweebs like Shaun and Dave, the emphasis is on the extraordinary nature of the ordinary human spirit. Heroes no longer bestride the land; modern cynicism about the obviously powerful makes such grandstanding self-parodying. Indeed, Turner makes no bones about this and has Dave’s company managers revel in their dishonesty like veritable pantomime villains. Instead the great self-improvement drive that continues to absorb society has made heroism out of becoming admirably matured. Stories like How to be Dead are pitched for us norms, reiterating the myth that anyone—even the losers—can be winners. Given the right supernatural conditions, of course. And it is pitch-perfect in tone—gentle and humorous, with little frissons of sarcasm. Turner is deft at turning on a pin’s head from giggling recognition of idiotic behaviour into something altogether more profoundly moving. Comedy and melancholy make great partners in crime if used properly, and Turner makes excellent use of the sweet-and-sour approach without once coming across as mawkish. There are nods to popular culture that firmly place it in the nerd-as-hero camp, and had my geeky heart cheering for joy. Yet the handling is never heavy-handed or hackneyed; which is a refreshing change, given the sub-genre is not brand-new. The characters grow in believable fashion, travelling through a process of revelation and change that is interesting and witty. Dave is annoyingly passive-aggressive to begin with, but in the course of the book makes an emotional journey that has the reader cheering for him, without recourse to an eye-rolling “oh, come on!” Melanie seems a bit of a cold cow, but she thaws without becoming a total drip. Wouldn’t we all like to have our tough exterior selves melted in gentle rom-com fashion? No? Just me? Oh, come on, you cynical bunch! This book is all about learning to give over protective cynicism, at least as much as it separates us from who we really are and finally admitting to our strengths: a transition noted in psychoanalysis as being far scarier than facing perceived failings. Dave learned to dumb down, fit in, and ignore his latent talents. But this, Grasshopper, is not the route to happiness, as his unfailingly boring life-before-his-eyes flashback teaches him. And Death… Terry Pratchett paved the way in creating a personable Death, but Turner’s Death likes cake and waxes sentimental over the fob watch the other three Horsemen gave him. He mourns and misses his departed fellow Apocalyptic anthropomorphic personifications, throws tantrums and turns the music up high like a teenager, and has surprisingly tender customer service skills; I defy any reader not to commiserate with his failings and foibles. As starter stories go, this has the makings of an extremely personable, enjoyable series of adventures. The writing is cheerful, the story is refreshingly lacking in overbearing, self-acknowledging ‘cleverness’ (always a possibility with comic fantasy), so it zips along in honest style. It is lighter reading, but so very entertaining, and does exactly what you want it to. It is an extremely visual story in style; it is easy to imagine how this would make a fun piece of telly, and yet it never lacks wit and wisdom, nor a definite literary touch of longevitous quality. Turner’s voice is a welcome addition to the genre, drawing very favourable comparisons with the big guns of comic fantasy.